A 6/8 strong cotton warp yarn. 200g cones with a mix of 80&percnt; cotton and 20&percnt; polyester. 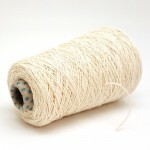 Warp Yarn 6/8 - Cotton & Polyester blend on 200g cones. 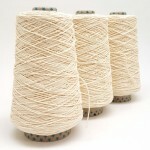 Warp cotton is a smooth, strong, 80&percnt; carded cotton & 20&percnt; polyester yarn. It is scoured, but there are still teeny tiny fragments of the natural cotton seed visible throughout the yarn, though they are hardly noticeable. 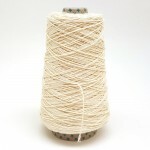 As it is undyed and blended with polyester it is a lovely crisp ivory shade. As the name suggest it&apos;s particularly good to use as a warp yarn on a variety of looms including tablet, tapestry, floor, peg or handloom as it is smooth and very strong. A very versatile yarn that is also ideal for braiding, macrame and knotting crafts and to use in the garden & around the house. The yarn will also dye easily using cold water or natural dyes, though gives a slightly mottled look due to the polyester. If a more solid effect is required (say for tassels at the end of a rug etc it could be painted with silk paints etc. 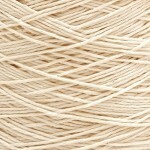 This nice neutral shade of cotton can also be used in the technique of candlewicking. 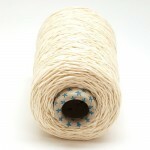 A highly versatile, great quality budget yarn - perfect for all your warp yarn needs.